Zion Market Research has published a new report titled “Fuel Resistant Sealant Market by Resin Type (Silicone, Plastisol, Polysulfide, Polyurethane, and Other Synthetic & Semi-Synthetic Resins) by Applications (Automotive, Aerospace, and Other Applications): Global Industry Perspective, Comprehensive Analysis, and Forecast, 2017 – 2024”. 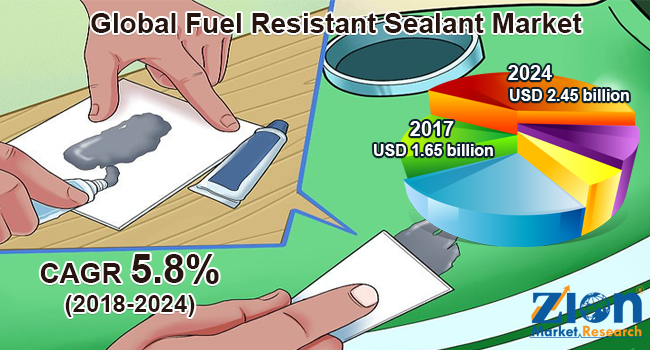 According to the report, global fuel resistant sealant market was valued at USD 1.65 billion in 2017, is expected to reach USD 2.45 billion in 2024 and is anticipated to grow at a CAGR of 5.8% between 2018 and 2024. Fuel resistant sealants due to its advanced properties such as it operate at a varied range of temperatures and its usage in several end-use industries has increased its demand. Additionally, the fuel resistant sealant is used for fuel storage purposes. Due to the technological advancements in the product, it is widely adopted by several industries as a low volatile organic compound. These fuel resistant sealants are used in storage tanks with probable exposure to chemicals, like ethanol, gasoline, and crude oil. The global fuel resistant sealant market is projected to witness significant growth in the upcoming years due to the increasing demand from the automotive and construction industries. Moreover, the growing demand for sealants in various industries across the world is having the most prominent influence on the global fuel resistant sealant market. The construction industry is likely to enhance the fuel resistant sealant market growth in the future. However, environmental concerns and fluctuating raw material prices may act as a restraint for the fuel resistant sealant market in the forecast period. On the other hand, the growing adoption of fuel resistant sealant in the aerospace sector is estimated to propel the demand for fuel resistant sealant market during the forecast period. Fuel resistant sealant market is classified on the basis of resin type, application, and regions. On the basis of resin type, the global fuel resistant sealant market is segmented into silicone, plastisol, polysulfide, polyurethane, and other synthetic & semi-synthetic resins. Polyurethane is projected to be the fastest growing resin type owing to its wide applications in several end-user industries. Polyurethane is a polymer composed of organic units joined by carbamate (urethane) links. On the basis of applications, the market is segmented into automotive, aerospace, and other applications. The automotive is the most dominating application and is anticipated to show significant growth in the near future. Moreover, growing automotive sectors across the globe are likely to boost the demand for fuel resistant sealants for various purposes. In 2017, the Asia Pacific accounted for the largest share in the global fuel resistant sealant market. The Asia Pacific and Latin America is the fastest growing market for fuel resistant sealant and is anticipated to continue its dominance in the upcoming years. Increasing construction activities in the budding countries of Asia Pacific like India, China, and Japan are projected to improve the fuel resistant sealant market in the near future. With the rising demand from the automotive industry in Latin America, the market growth for fuel resistant sealant is expected to increase in the coming years. Europe and North America are likely to grow at a slower growth rate. Expanding the aerospace industry in the regions is estimated to augment the fuel resistant sealant market in the forecast years. Further, the Middle East & Africa is projected to hold immense potential for fuel resistant sealant market due to the growing oil & gas industry in the region. The fuel resistant sealant market consists of a large number of manufacturers and is highly fragmented. The manufacturers operating in this market include Bostik, Inc., The Dow Chemical Company, PPG Industries, Inc., Royal Adhesive & Sealants, BASF, 3M, Lord Corporation, Dow Corning Corporation, Sika AG, MECS, Inc., Hodgson Sealants, Permatex, and Tremco Sealants, among others.